ABT Sportsline has its hands permanently tied with the development of new tuning kits and accessories for Volkswagen Group cars. Despite this, the tuner still finds enough time for an occasional bout of nostalgia. 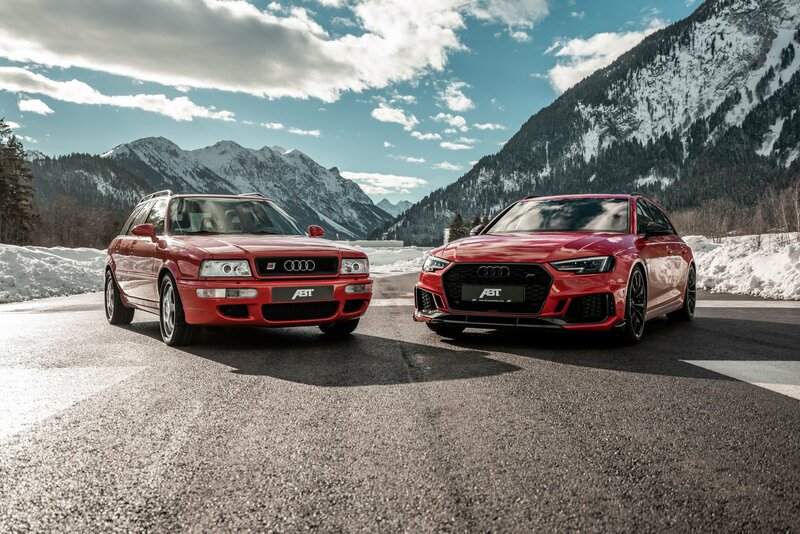 Look at this series of photos dedicated to the award-winning Audi RS2 Avant, and you will understand what we mean. The company took two vehicles, the 25-year-old RS2 Coupe and a 2019 RS4 Avant, to a photo shoot on an airfield. Both cars came with a number of exterior and tech upgrades. The elderly RS2 had its 2.2-liter turbo engine equipped with a better turbocharger, an adjustable camshaft, and a stainless-steel exhaust system. As a result, its output rose from the stock 315 hp (235 kW) to 360 hp (268 kW). The 2019 Audi RS4 Avant has received similar upgrades and now produces 530 hp (395 kW) and 690 Nm (509 lbft) of torque. It also sports a lightweight body kit, 20-inch glossy black wheels, height-adjustable springs, and a sports-spec anti-roll bar.